With the comming launch of the Triton 1/2 satellites it is time to think of a 13 cm receive option. On my old Ham Radio site I had a page of a simple patch antenna feed that was used for AO-40 and we will give that a go. In an effort to receive Triton 1/2 on 2.4GHz, several feeds where trialled starting with a Helix and a G3RUH patch. Following the experience of other operators the number of turns on the helix were adjusted for reported optimum performance. A G3RUH patch was purchased and used as a bench mark for further tests. From the start the Patch generally outperformed the Helix. 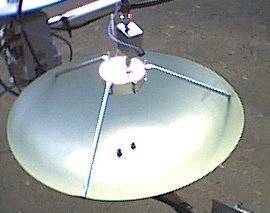 Ultimately, when the K3TZ design was tested, the ease of construction and consistency of results demonstrated the worth of this antenna. Fig 1. G3RUH Dish and Patch with DEM 13ULNA pre-amp. Fig 2. K3TZ dimensions and construction details – note measurements in millimetres. From a practical point of view, and after constructing several of the K3TZ units, the patch proved its worth by its consistent performance, ease of construction and ease of mounting. It is important that the patch is protected from the elements as any water between the patch element and the ground plane will affect performance. In one application a small plastic pale covers the Patch and the DEM 13ULNA pre-amp protecting both units.